We welcome families & couples for glamping breaks here at our Dorset glamping site with Yurts, Bell tents, Country Kabin and GeoDome glamping accommodations. 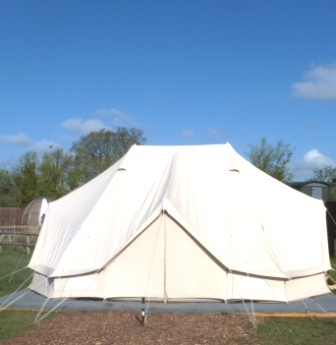 Even larger families of up to 6 can glamp in one accommodation with our larger Family Bell tent, and family groups are welcome to book several glamping units to accommodate their party to celebrate special occasions such as birthdays, anniversaries and inter-generational family gatherings! Our glamping Family Bell tent is ideal for families of up to 6 as it includes a double bed and four single futon sofa beds that can be made into chairs to relax on and save floor space during the day. 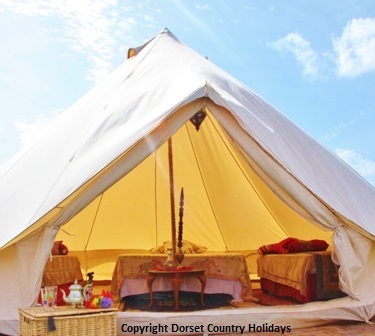 Bell tents are a great way to spend a glamping holiday - our Bell tents sleep up to four people, for more information please see our Bell tent glamping page. 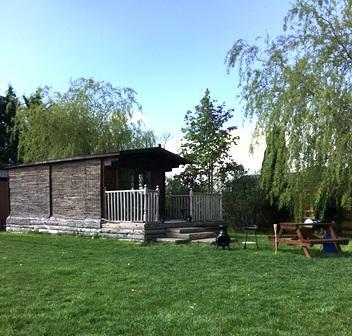 Our Country Kabin provides a cosy getaway for couples with a double bed behind the sliding "bookcase" door in the master bedroom and a double sofa bed in the living area to sleep up to 4 people. 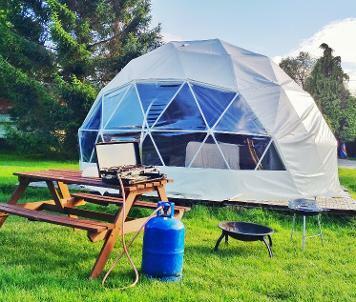 Our glamping Dome is our most modern and luxurious accommodation, the interior design is inkeeping with the sleek exterior and based in a round from central faux-stove heater - a panoramic image is available on our Dome glamping page. Our Stargazer Yurts provide a spacious interior with a double bed and two single beds and you can view the stars on the clear nights through the roof light! All pppn (per person per night) prices are based on full occupancy of accommodation during midweek dates in the low season. 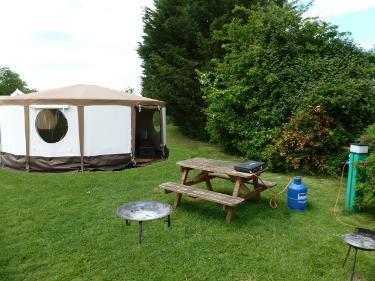 Please see our glamping prices page for full glamping rates information.